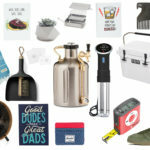 A round up of cool dude gifts just for dads (or your baby daddy, or other dads you know in your life)! A fancy retro fan to keep dad cool in the summer. So he never loses his keys again. These Beats are so hot right now: noise cancelling and excellent sound quality. Classic kicks for a classy guy. So you and dad can have beers together. 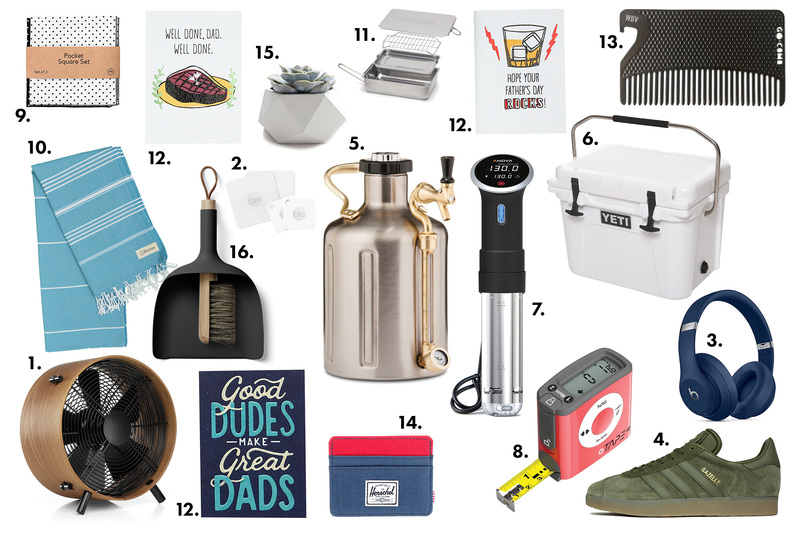 Only the best for you dad will do and everyone knows Yetis are the best coolers around. Because he’s the kind of dad who sous-vides before he grills. Dad’s like measuring things, they just do. Because it’s hip to have a pocket square. A Turkish towel that’s ready for anything: after the gym, the beach, or a picnic. A mini stovetop smoker so dad can add some smokiness to all his favorite meats. Because sometimes all dad really wants is a heartfelt card with a handwritten message. It’s a comb and a bottle opener. And it fits in his wallet! A fun, colorful wallet so he can spot it easily. A modern concrete planter so he can have a little bit of zen at his desk. The classiest dustpan, just in case he’s a neat freak.